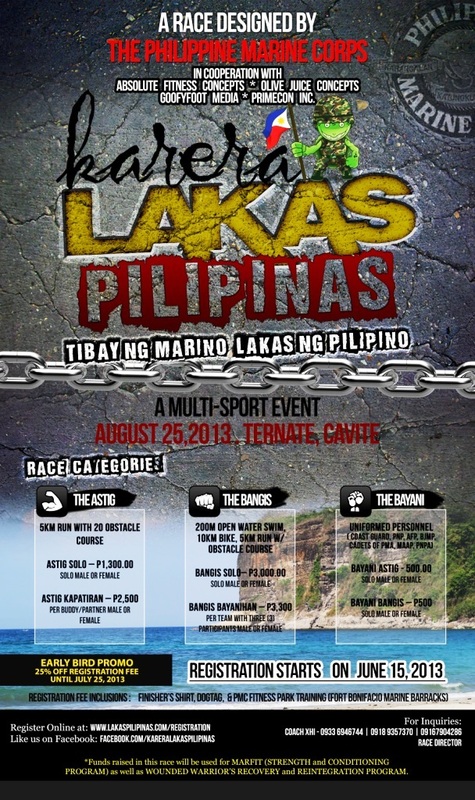 The Philippine Marine Corps together with the LakasPilipinas Team, is organizing an event that serves as an advocacy on health and fitness. This will happen on August 25 this year in time with National Heroes Day celebration. 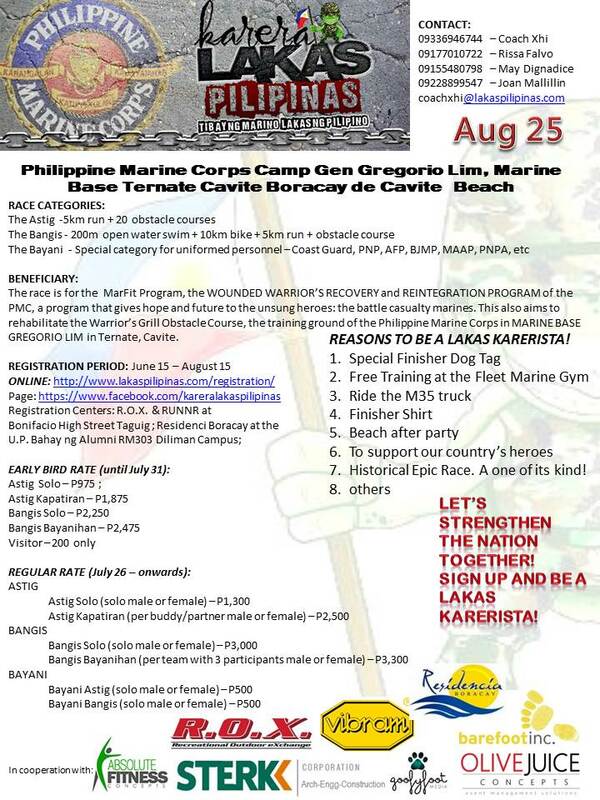 The event is entitled KARERA LAKAS PILIPINAS, Tibay ng Marino Lakas ng Pilipino and shall be held at at the Philippine Marine Corps Camp Gen. Gregorio Lim Marine Base in Ternate Cavite. This is the first time that the training grounds of the Philippine Marine Corps will be open to the public. Funds raised in this event shall be used for the MARFIT (Strength and Conditioning Program) as well as WOUNDED WARRIOR’S RECOVERY and REINTEGRATION PROGRAM. Philippine Marine Corps has been the subtle pillars of the country since time immemorial. As the force of choice, every marine silently perform task without reservation and regard of their own lives. A serendipitous and unsung hero of our country is hoping for your support. Fitness is a great equalizer – both military and civilian needs to be fit in order to have a balanced and productive life. This is what the race is all about. We have a booth that is manned by our marine brothers and sisters from 5:30pm till closing, at 3rd Floor of R.O.X. and will be setting up in RUNNR by next week. We are also working with Residencia Boracay to facilitate onsite payment at their QC Office (Rm 303, U.P Bahay ng Alumni, Magsaysay St., University of the Philippines Campus, Diliman, QC) by next week.